Bingo Australia’s website opens up with a home page that is big, bold and expansive, a lot like the country that it is named for. To some tastes it may seem a bit busy, but as we’ll see in our Bingo Australia review, Bingo Australia has a great deal of information to pack in, information about all the goodies in store for you as a player. So relax, look around and join in the fun. Just in case you need any encouragement to play bingo, check out the latest winners and Yesterday’s Prize Total, both prominently on display. In true “no worries, mate” Aussie style, signing up is simple. Just fill in the convenient web form with your basic personal details, choose an online nickname and a password and you’re all set to begin playing. Online bingo is offered all day and night around the clock at Bingo Australia. So no matter what your schedule, you will be able to find the time for a game or three. Just check the game line up on the home page of the site to see what is coming up. Bingo Australia knows you come to the site for a nice sociable time and the in game chat rooms are a big part of it all. The pleasant and professional Chat Managers work the crowd, making sure that everyone is happy and included. Short and sweet – and often silly – chat games are hosted by the CMs to keep the mood upbeat and the prizes rolling. For a change of pace there are also pokies galore, which are worth a mention due to the large selection and excellent quality. Bingo Australia gives new players a warm welcome, with a free no deposit bonus of $20 on sign up, followed by a 600 percent match bonus on your first $20 deposit. That means you’ll deposit $20, yet start playing with a total of $160! What’s more, you’ll continue to earn bonuses on every deposit you make in the future. You can also take part in great promotions like the $50,000 Sydney Getaway Contest, cash back offers and free rolls. 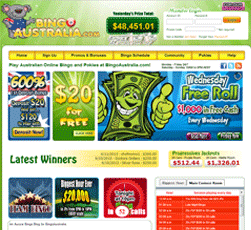 Bingo Australia is operated by Parlay Entertainment, creators of the very first bingo site on the Internet. Your privacy and safety online are of great concern to the folks at Bingo Australia. To this end they use the most up to date data encryption methods available to protect your personal and payment information from unauthorized persons or hackers. Should you have any questions about the site, consult the extensive Help section, which includes Technical Assistance Tips and Tricks. For further help, contact the customer support agents at Bingo Australia via Live Chat 24/7. For non urgent inquiries, you can open a Customer Care ticket from your account.